The inaugural Robert M. Minkoff Academic Symposium at UrbanGlass drew 100 glass department heads, faculty, administrators, and students from around the world to Brooklyn, New York, for three days of lectures, panel discussions, a tour of Manhattan galleries, and numerous opportunities to network with peers. Tina Aufiero, artistic director of Pilchuck and a mixed-media artist, delivered the keynote address. Graduate students from MIT's Media Lab discussed a hot glass digital printer they developed with Peter Houk and his Glass Lab at the prestigious university. Glenn Cook, chief scientist at The Corning Museum of Glass, delivered a presentation with Amy Schwartz, director of The Studio, about the new specialty glass residency where artists are invited to work with exotic formulations of glass in the Corning, Inc., archive. Helen Lee, head of glass at the University of Wisconsin, Madison, talked about how multiple video cameras can provide accelerated skills acquisition in the glass studio. These are just a few of the notable presenters and presentations that provided unique insights into the most important technologies emerging for use in the glass studio. With a gallery tour, panel discussions, receptions, and multiple opportunities to connect with leading educators in the field, the symposium was a unique opportunity to advance the understanding of the role of new technology in the field of glass education while networking between peers. With support from the Robert M. Minkoff Foundation, the first "Art & Glass Week" is took place at the Samuel H. Jones Glass Center at Salem Community College. in late August 2015. Sponsored by the Minkoff Foundation, the program provided a first flameworking experience to at-risk students from Ranch Hope, a nonprofit that offers intensive services to over 90 moderately, emotionally disturbed young men and women. The instructors included Dennis Breining, instructional chair of scientific glass technology at Salem Community College; artist Paul Stankard, an SCCC alumnus, and Douglas Ohm, who serves as the coordinator of the SCCC's glass instructional center. 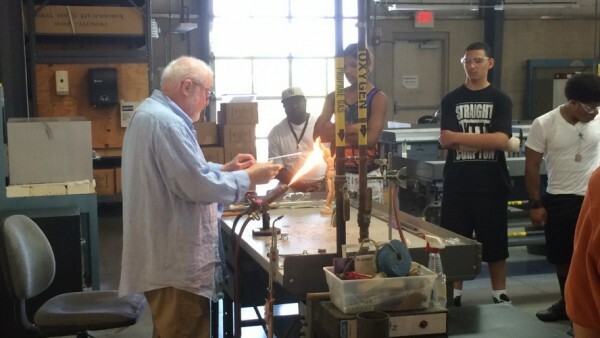 Running from August 24th through August 28th, the five-day program sought to give students an opportunity to develop hand-skills and explore creative expression as they learned about all aspects of the flameworking process. Opening on September 13, 2014, and running through February 15, 2015, the Bergstrom-Mahler Museum of Glass in Neenah, Wisconsin, exhibited almost 70 works by artist Paul Stankard drawn from the Robert M. Minkoff collection. This retrospective exhibition traces the evolution of Stankard's botanical portraits in glass from his earliest attempts at paperweights to his innovative new encased forms that have expanded the scale and intricacy beyond anything that has preceded it. The exhibition is a testament to the power of a collector-artist relationship that has opened the world of glass art and the visionary advances of one artist to a broader audience through an exhibition that has traveled to several venues. A coffeetable book that documents Stankard's achievement published by the Foundation serves as the exhibit catalog. Robert M. Minkoff encountered Paul Stankard’s work in 2005 and, in a very brief period, built a definitive collection documenting the artist’s journey in glass, with examples of the key innovations that Stankard has pioneered in bringing the paperweight form out of its traditional small form factor and into triptychs, assemblages, and vertical presentations. The Bergstrom-Mahler exhibition will continue through February 15th, 2015, and a special weekend event is planned from October 10th through the 12th that will bring together art lovers and Ferrari collectors to celebrate great artistry. There will be presentations by Robert Minkoff Foundation managing trustee and foundation director Andrew Page. More information. On December 6th and 7th, 2013, the nonprofit art center UrbanGlass in Brooklyn, New York, will host glass educators for a two-day symposium to discuss "Issues in Glass Pedagogy." Jack Wax, a professor at Virginia Commonwealth University's Craft/Material Studies Department, will deliver the keynote presentation. Former Pilchuck artistic director Ruth King and artist Dan Clayman will also be offering featured presentations and participating in a panel discussion on the question: "Does the inherently complex nature of glass process work for or against the development of a conceptual framework?" A call for papers is also being issued, with selected presenters receiving a waived conference fee of $175, and an honorarium. For more information or to register for the symposium, visit the event page on the UrbanGlass website. In late March 2013, Salem Community College honored philanthropist Robert Minkoff (pictured, far left), Abe Fleishman (second from right), and maestro Vittorio Costantini (far right) at the 2013 International Flameworking Conference (IFC). 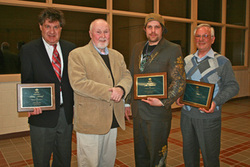 SCC Distinguished Alumnus and IFC Conference Chair Paul J. Stankard (second from left) presented the awards. Minkoff was recognized for advancing excellence in glass education through his ongoing support of the SCC glass art program with endowed scholarships for first- and second-year students. He is also a longtime supporter of the International Flameworking Conference. “We appreciate his strong advocacy for Salem Community College and the wonderful example he sets for others,” said Stankard. The Chrysler Museum of Art and the The Robert M. Minkoff Foundation are pleased to announce a new collaboration: 4Front: Innovation From All Angles, an artist residency that will take place from January 8th through 22nd, 2014 at the Chrysler Museum Glass Studio in Norfolk, Virginia. 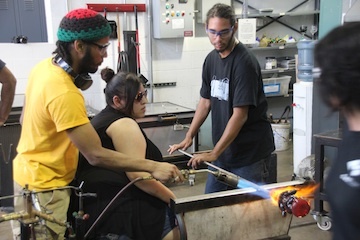 The "4Front: Innovation From All Angles" residency is designed for emerging artists with some glass experience. The residency seeks proposals for a contemporary art project using glass that is groundbreaking in one or more of the following areas: technique, concept, energy efficiency, and media fluency (mixed media or performance). The deadline for submissions is September 1, 2013. More information about how to apply can be found at www.4frontresidency.org. The Robert M. Minkoff Foundation (awarded 501c3 status in 2011) is focused on furthering the use of glass in the field of contemporary art and advancing technical knowledge about glass art process. The foundation invests not only in residencies and educational projects, but in disseminating important new developments, particularly in the areas of energy-efficient furnace design and glassmaking process. The Robert M. Minkoff Foundation presented glass artist Paul Stankard with the debut Robert M. Minkoff Foundation Award for Excellence, in celebration of the artist’s extraordinary career and outstanding contributions to the field of glass art. The presentation was made during a special VIP event that kicked off the James Renwick Alliance’s Spring Craft Weekend that ran from April 4 – 7, 2013. Stankard attended this event as a recipient of a Masters of the Medium award by the Renwick Alliance. The award was presented by Robert Minkoff, managing trustee of the organization that bears his name, during a special dinner event on Thursday, April 4, 2013. Befitting a foundation dedicated to the advancement of glass art, the Robert M. Minkoff Award for Excellence includes the presentation of a one-­of-­a-­kind glass sculpture to the award recipient. The work of New-York-­City-based sculptor Edison Osario Zapata, the inaugural award symbolizes the theme of coming together in common cause that is at the core of the Robert Minkoff Foundation’s efforts. Created out of scores of hand-­pulled glass canes fused into a rectangular block in the kiln, the clear glass sculpture, measuring approximately 10-­inches tall, reveals a complex internal patterning that belies its solidity. It stands on a base engraved with the recipient’s name and the year of the award. On Saturday, March 9th, approximately 100 people filed into the theater at The Museum of Arts and Design to view a screening of the documentary film titled The Toledo Workshop Revisited (2012). The 48-minute film that tracked three resident contemporary artists as they rebuilt the original 1962 furnace that launched the Studio Glass movement and proceeded to experiment with it to make their own work, was followed by a panel discussion led by Jennifer Scanlan, who curated the exhibition Playing With Fire: 50 Years of Contemporary Glass, on view at the museum's third-floor galleries. The three artist residents — Amber Cowan, Kim Harty, and Matthew Szosz — joined Scanlan onstage after the screening to discuss the residency project and its impact on their own work. Also onstage was Jeff Mack, the Toledo Museum of Art's Glass Studio manager, who partnered with the Robert M. Minkoff Foundation to make the artist residency possible. Following the screening and discussion, many attendees migrated to the opening reception for a solo exhibition of Amber Cowan's work at Heller Gallery in downtown Manhattan. Also on view were individual works by Kim Harty and Matthew Szosz. 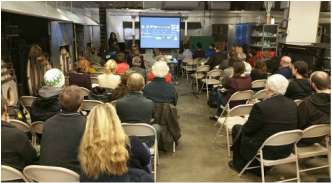 There were two screenings of the 48-minute documentary film The Toledo Workshop Revisted during the 2012 SOFA CHICAGO art fair that took place November 1st through 4th at Chicago's Navy Pier. This film documents a week-long residency at the Toledo Museum of Art that took place in March 2012 that honors the past and celebrates the future of creative experimentation in glass. The November 2nd and 3rd screenings were shown at 3:30 PM at the Audi Conversation Lounge, a new multi-media screening room on the main floor of Navy Pier. 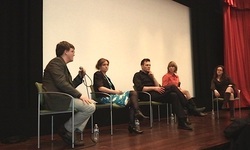 The screenings werefollowed by Q&A with Robert Minkoff, Managing Trustee of the Robert M. Minkoff Foundation; Andrew Page, Director, Robert M. Minkoff Foundation; and two artists from the residency/film: Amber Cowan, represented by Heller Gallery, NY (Friday); and Kim Harty, represented by UrbanGlass, Brooklyn (Saturday). 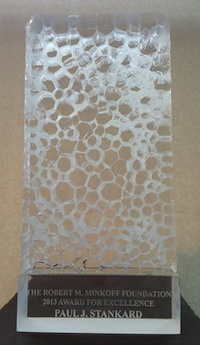 For more information on SOFA, see the website www.sofaexpo.com. Participants in the 2012 Glass Art Society conference in Toledo had the opportunity to put themselves in the shoes of the Studio Glass pioneers. 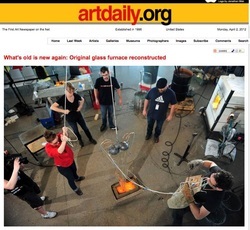 In March 2012, a 1962-style furnace was built during an artist residency at the Toledo Museum of Art Glass Pavilion to celebrate the 50th anniversary of the original workshop. That same rebuilt furnace was up and running during the Glass Art Society conference at Jack Schmidt Studios at 340 Morris Street in downtown Toledo and available to conference attendees. EXPERIENCED glassblowers were able to check it out free of charge during the hours listed below. Just like for the participants in the 1962 workshop, the furnace itself served as the glory hole and annealing was available in vermiculite-filled cans. Access to the furnace was on a first-come, first-serve basis, and any work left to anneal was at your own risk. Any finished work had to be picked up. 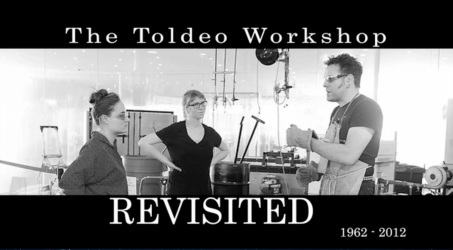 The Robert M. Minkoff Foundation produced a documentary film about the 2012 Toledo Workshop Revisited artist residency commemorating the 50th anniversary of the Toledo Museum of Art Workshop in 1962, an event which launched the Studio Glass movement. This 48-minute-long film by Derek Klein follows resident artists Amber Cowan, Kim Harty and Matt Szosz as they build a 1962-style furnace and attempt to realize their contemporary art projects using 50-year-old technology and tools. Mixing the history of the original workshop with an exploration of process of three contemporary artists who represent a new approach to the material of glass, the documentary shows two generations of artists separated by half a century but united in the search for expression in glass. The documentary was screened for a VIP audience at the Sculptural Objects Functional Art Fair in Chicago in November 2012, and will have its official US premiere at the Museum of Arts and Design in New York City on March 9th. More information, including how to purchase tickets, can be found here. Robert Minkoff with Karen Mooney (costumes by Nancy De Dubois). For the 2012 Toledo conference, the glass fashion show extravaganza returned to the Glass Art Society annual gathering after a three-year break. The Robert Minkoff Foundation supported the creation and presentation of a wearable art costume by artist Nancy De Dubois. The Roman-era interpretation modeled by Robert Minkoff, managing trustee of the Robert Minkoff Foundation (Also pictured: artist Karen Mooney). Minkoff and Mooney joined dozens of other artists and models parading their one-of-a-kind creations that use glass as a material for adornment at the Toledo Glass Art Society conference in June 2012. At the June 2012 Glass Art Society Conference, attendees arriving for registration had the opportunity to view a rough cut of a documentary film about the 2012 Toledo Workshop Revisited artist residency that commemorated the 50th anniversary of the Toledo Museum of Art Workshop in 1962 that launched the Studio Glass movement. This hour-long film by Derek Klein follows resident artists Amber Cowan, Kim Harty and Matt Szosz as they build a 1962-style furnace and attempt to realize their contemporary art projects using 50-year-old technology and tools. Mixing history with an exploration of process of three contemporary artists who represent a new approach to the material of glass, the documentary showed two generations separated by 50 years but united in the search for expression in glass. Showtimes for the documentary on Wednesday, June 13th, were 12:30 PM, 2 PM, and 3:30 PM in the Park Inn Hotel ballroom adjacent to the registration desk for the conference. Admission was free. *For those unable to attend the Wednesday screenings, the film was also available for viewing at Jack Schmidt Studio (340 Morris Street, Toledo) on Thursday (9 AM - 4 PM), Friday (9 AM - 2 PM), and Saturday (11 AM - 2 PM). Daily fine art blog www.artdaily.org ran a large article on the Toledo Workshop Revisited artist residency co-sponsored by the Robert M. Minkoff Foundation and the Toledo Museum of Art. The project concluded on the evening of Friday, March 30, 2012 with artist demos and slide-show presentations, drawing an audience of 150. The furnace had melted most of the 750 pounds of Johns Manville #475 marbles donated to the residency, and the three artists had each made several works: Matthew Szosz had successfully realized several tube draws (short lived tall cylinders of glass that once were how windows were made), Amber Cowan had two dozen vessels incorporating the marbles, and Kim Harty had created a delicate lattice of stringers as well as a serene video projection installation that used shards of broken glass to bounce a moving beam of light that echoed a pipe's trajectory on the bench. In March 2012, the Toledo Museum of Art commemorated the 50th anniversary of Harvey Littleton's seminal 1962 Toledo Workshop by offering three artists the opportunity to realize a contemporary project using a furnace modeled after the one that Littleton and Dominick Labino developed 50 years ago. It was this small-scale furnace design that made the Studio Glass movement possible. To honor the past and celebrate the future of glass, selected members of a new generation of artists who directly experiment with the material in their own way were invited as resident artists for this project. It was direct experimentation with the material that drove Harvey Littleton's quest to make glass available to artists working in a studio setting.The residents began by participating in the building of a 1962 style furnace. The residency ran from March 22nd through March 31st, 2012, exactly 50 years from the original event. The residents each made a public presentation about their projects on March 30th from 6:30 - 8 PM. 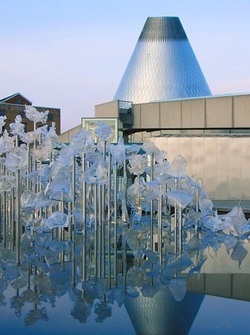 From November 12, 2011 through June 17, 2012, the Museum of Glass presented a major retrospective exhibition featuring more than 70 of Paul Stankard’s intricately flameworked still life sculptures encased in clear crystal. Spanning more than 40 years of Stankard’s career, from his earliest attempts at paperweights in 1969 to a monumental eight-inch Honeybee Swarm Orb specially commissioned for this exhibition in 2010, the work was grouped into categories of specific forms, many of which Stankard innovated as he moved beyond the traditional paperweight in search of new ways of presenting his botanical compositions. This exhibition, which will travel to the Museum of American Glass at Wheaton Arts was made possible through the support of the Robert M. Minkoff Foundation. Read more about the exhibition at the museum's Website. A new way of understanding the accomplishments of a true American master and his development from his earliest attempts at capturing a daisy in glass in 1969 to his glorious 2010 orb encasing a honeybee swarm. Paul Stankard's finely wrought organic detail is illuminated through never-before-seen high-resolution photographs enlarged and printed with the highest production values to create a unique book that is itself a work of art. 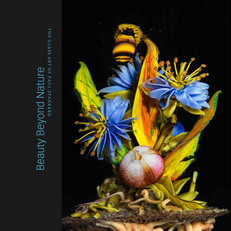 In an essay by William Warmus, an interview by Andrew Page, and photographs by Ron Farina and Douglas Schaible, Beauty Beyond Nature (published by the Robert M. Minkoff Foundation, Ltd., 2011) reveals Stankard's work as a powerful touchstone that connect us to the potency of the natural world and remind us of what it means to be alive. Hardcover. 168 Pages. $80.00. Available for online purchase.